Anybody remember the lowly penny? One cent. Maybe you still have one lying around somewhere… Place a copper penny on the table. Look at it. Now, we are told that there are 3 million layers of atoms in that penny. Atoms all arranged in a tight formal structure, three million layers thick. That’s how tiny atoms are. That is all there is to the atom. Outside the orange at the pitcher’s mound and the gnats flying high above, there is nothing. Let that sink in! The single atom is made up of almost no matter at all. 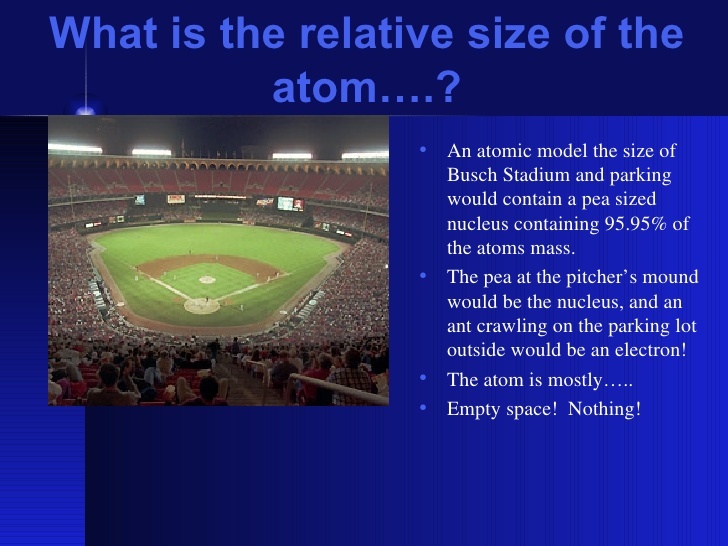 Relatively speaking, the atom is almost entirely empty space! Of the volume of a standard baseball field, the only matter in it are an orange and a bunch of gnats. That’s it. Nothing else. If you could now look at the nucleus of that atom, the picture changes dramatically again. We imagined the nucleus as our orange at the pitcher’s mound… Now, we blow that up to the size of the baseball field… Again, vast, empty space with particles – muons and leptons and other strangely named particles – are blinking in and out of existence, randomly, as it were. At this level of reality there is an indeterminism built right in to the nature of reality. Now consider this: if all space from every atom that made up our body were removed, it would collapse to a tiny fraction of a grain of sand. Atoms are 99.99% space. What then is your human body? What are you if you are 99.99% empty space? Yet when I slam my hand on the table, I hurt myself. If 99.99% of matter is space, what is prohibiting my hand to penetrate through the table? Forces! The very forces that hold this universe together. In the end, what we experience as solid are force fields built around certain concentrations of energies. Reflect on this incredible strangeness. What is the nature of the universe, then? Is matter an illusion? To what degree are you able to free yourself from thinking of this universe in terms of “stuff,” matter, and think in terms of energy and forces? What changes in your understanding of God and the Universe if, in fact, we accept that all that we experience is primarily an interplay of energy and forces? What do you find most useful – least useful – about these reflections? What part of your personal view of things needs to be changed, is confirmed, by these reflections? How does that make you feel? What questions does all this raise for you?